This is why I love whole chickens. 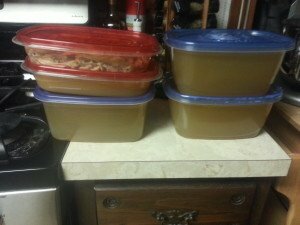 Pictured above is 30 cups of glorious chicken stock and a 4 cups of meat from a leftover chicken I made earlier in the week. I started by brining the chicken in a solution of salt and sugar (1/2 cup each). Just put the salt and sugar in a bucket. I used my dough bucket . Add two quarts of water and stir everything together. Add the chicken and refrigerate for one hour. 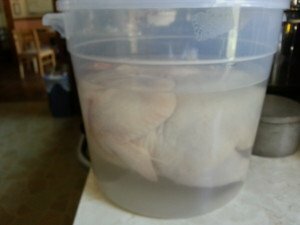 Take the chicken out of the brine and dry it off well. 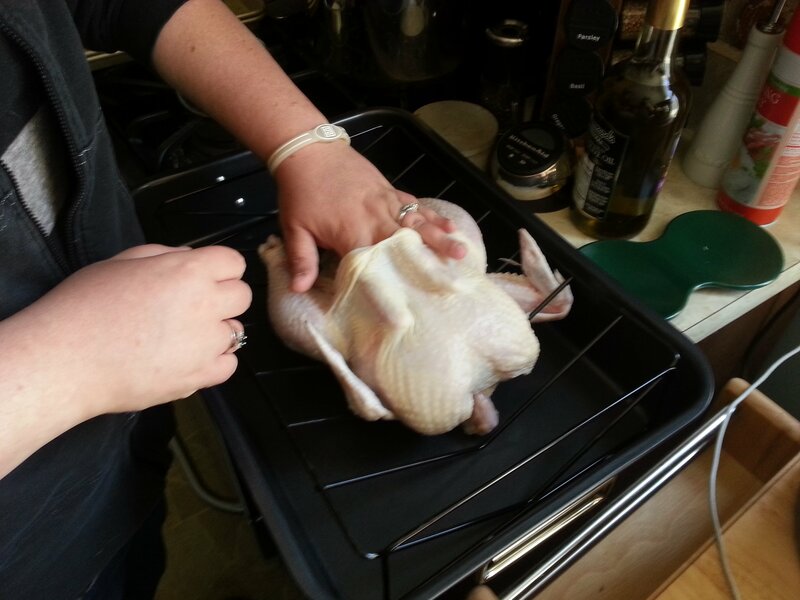 Put the chicken on a rack in your roasting pan. I love using a roasting pan with a V-rack because it is easier to flip the chicken around when cooking. Slide your fingers under the skin to separate the skin from the breasts. Take one tablespoon of butter and divide it between the two breasts. I smooshed it (that is the technical term) into a few pieces and placed it under the skin. See? This will make lovely yummy chicken. 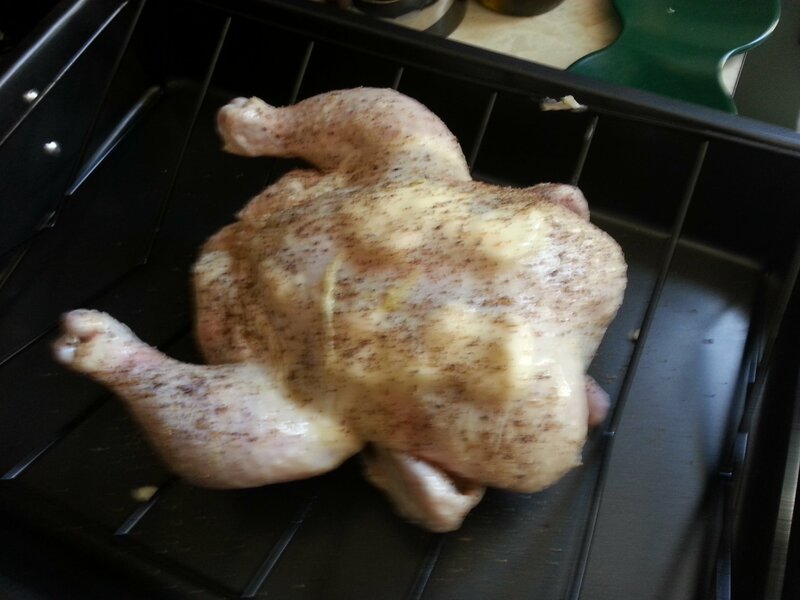 Now drizzle some olive oil over the bird and rub the oil all over the skin. Wash your hands at this point so you can salt and pepper the bird. 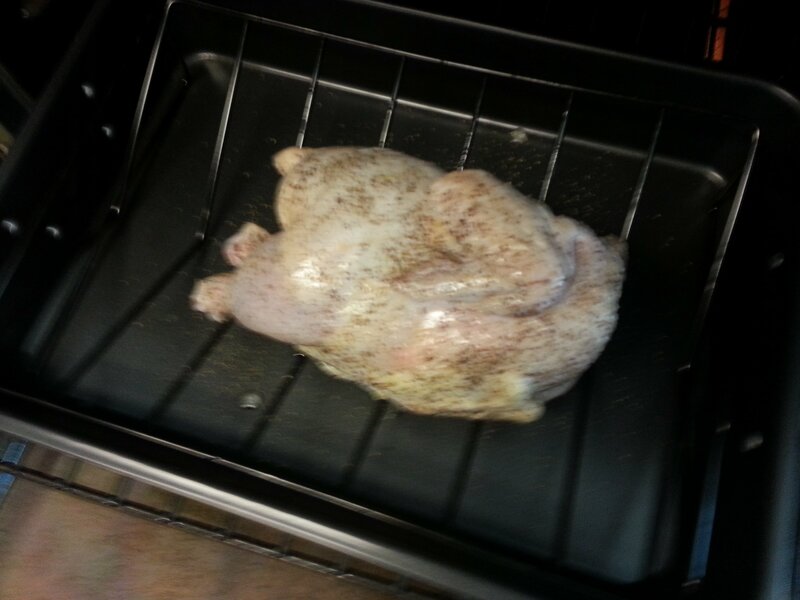 Turn the chicken on its side, so the drumstick and wing are facing up, and cook in a preheated 400 degree oven for 15-20 minutes. When the timer goes off, turn the bird on its other side and cook for another 15-20 minutes. Here is a picture of the chicken the first time he went in. 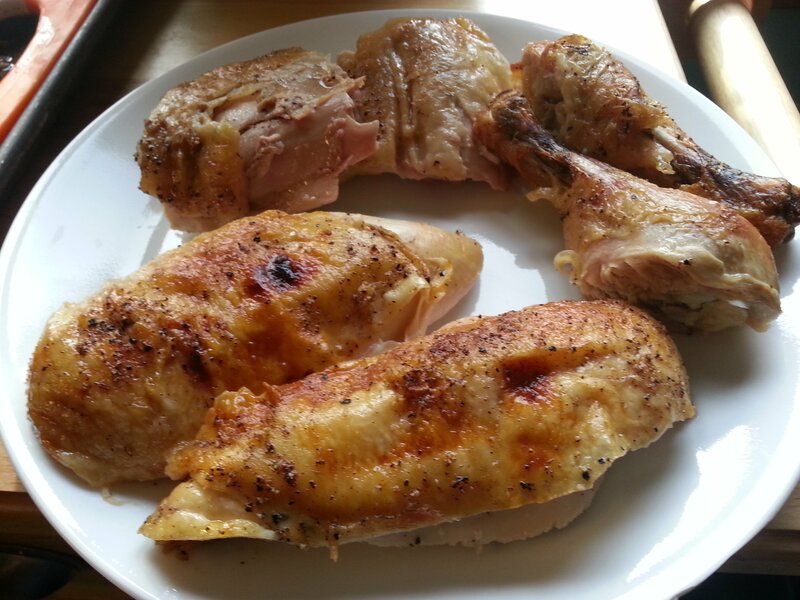 After cooking on both of the sides, flip the chicken so the breast is now up and cook for an additional 30-40 minutes or until the breast meat registers 160 degrees. 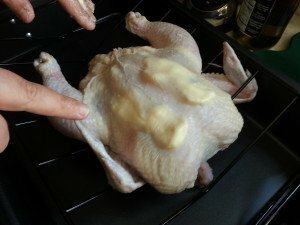 Take the chicken out of the oven and let it rest 5-10 minutes before carving. 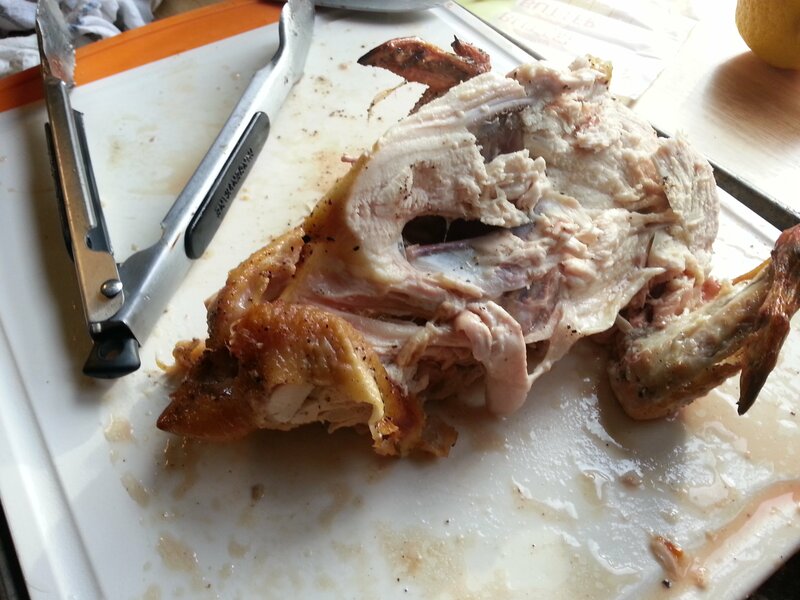 Here is the carved up chicken. The skin was nice and crisp and the meat was so juicy. Plus, I was left with the rest of the chicken! Today I took that chicken and put it in a large stock pot. Remember the vegetable scraps I had leftover from prep day? Well, those went into the pot also. Cover the whole thing with water (I just leave about 2-3 inches at the top of the pot so things don’t simmer over) and cover the pot. Bring the water to a simmer and cook it for as long as you can. This batch was probably fine after about 4 hours but I cooked it for about 8 hours. Because there was so little skin left, there wasn’t a ton of fat to skim off the top. You don’t have to do too much skimming because any fat will turn to solids once the stock has cooled. Let the stock cool for at least an hour on the stovetop before straining. I use a fine mesh strainer and a ladle to get out as much of the stock as I can. I put the strainer over the container that I want to fill and use the ladle to pour stock over the strainer. Once I have gotten out all the stock I can, I start discarding the vegetables and hunting for chicken meat. I put all the meat in a separate container. This chicken is great for casseroles, soups, tacos, chicken salad or whatever else you might want to use it for. I ladle out more stock as I can and repeat the discarding and ladling process until the stockpot is empty. 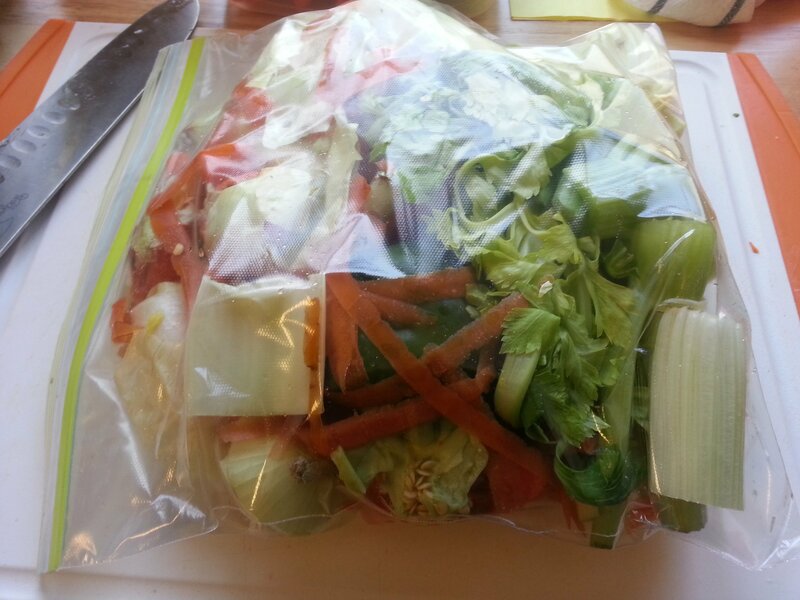 Put covers on all of your containers and place them in the fridge until any remaining fat solidifies. Then you can spoon out the fat and use the stock immediately or place it in the freezer until you need it. I purchased a 4 pound naked chicken (no hormones, vegetarian diet, awesome chicken) for $10. We had one dinner the night I roasted the chicken. I also got 30 cups of stock from it. When I purchase chicken broth at the store, which is not as flavorful as chicken stock, I usually pay $2 for 4 cups. The equivalent amount of broth at the store would cost me $15. 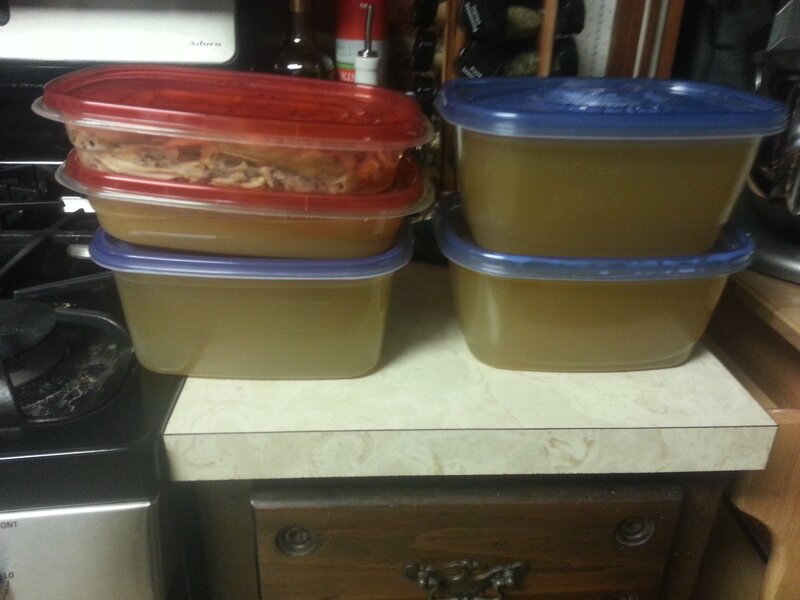 I also got four cups of chicken out of the deal and dinner for two as well. The equivalent amount of breast meat would have cost me at least $4 plus another $3 or $4 for the rest of the meat. So for the price of a $10 chicken, I got about $22 worth of stock and meat out of it. Plus, the stock you make at home is so much better than the stuff you get at the store. You can customize the flavor depending on the vegetables you put in and you can control the salt content. Store bought stock typically has a ton of salt. You can also make stock with the leftovers of rotisserie chicken, so next time you get one don’t throw out the carcass. Make stock!